I had been looking for some board wargames to add to my meagre collection of this genre. I particularly was interested in board games because generally they do not require so much space (yes, I know, some of the bigger ones are really big), they are self contained and many have good suitability to solitaire play. In addition, I was looking for some games that had a ancient feel about them. I had a tax refund cheque coming so this seemed the perfect opportunity to add a game or two to the collection. The first addition I made was the Salamis add-on to the War Galley Module of the Great Battles of History series. I can’t resist a good naval game. I was also looking for some ancient based games so the next game I selected was GMT’s Chariots of Fire. 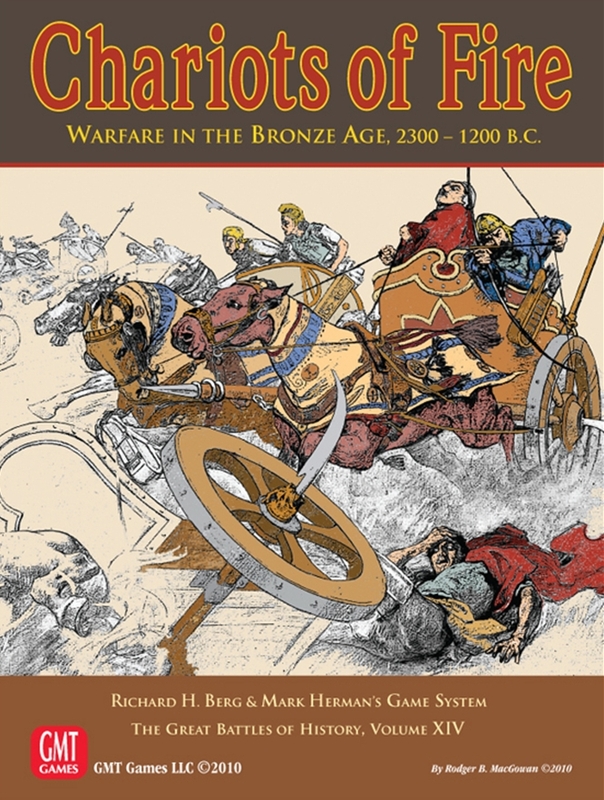 This is also part of the Great Battles of History series and covers early warfare, when chariots ran amok on the battlefield. This game covers warfare in the Bronze Age, from about 2300 to about 1200 BCE. The game itself is well presented and includes everything needed to start to play, including a dice and some nice little plastic bags to make it easier to store the pieces ((I may look at getting some of the counter trays GMT produce in the future)). I will frankly admit now that until I saw this game, I had never heard of the Arzawa so from the point of view of stimulating me, the game has been a success already. I shall spend some time finding out more about them in the future ((I now know that Arzawa in the second half of the second millennium BCE was the name of a region and a kingdom in Western Anatolia, likely to have extended along southern Anatolia alongside a belt across the Lakes Region until the Aegean coast. Arzawa’s central area was later to become known as Lydia)). Troy (c 1200 BCE) – Danaan v Trojans – the one the movies get made of and that is famous from Homer’s “The Iliad”. Many battles to recreate in this board game and it seems the average battle lasts about two hours. I am really looking forward to starting to play some of these. The game itself rates as 7.94 out of 10 at Board Game Geek.